Speak With an Insurance Adjuster. Call Us Now! Insurance Claim Adjusters You Can Trust! 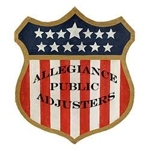 Allegiance Public Adjusters is a leader in professional loss consultation for business and homes that have sustained physical due to vandalism, theft, water, wind or fire. Serving clients throughout Southeastern Pennsylvania, we’re a highly experienced insurance claim adjuster with a commitment to advocate your interests, and not the interests of your insurance company. If your home or business suffers damages such as those listed above, call us immediately for free on-site policy review and damage consultation at (215) 309-4721. We know how burdensome it can be when dealing with insurance companies after a devastating loss to your home or business. As professional property claim adjusters, we pride ourselves in being skillful and knowledgeable, while offering professional assistance to our clients in their time of crisis. Our overall goal is to relieve you of the claims process while working hard to recover the maximum settlement. Your insurance company will assign you an adjuster. Don’t be fooled! This adjuster is paid by the insurance company to represent their interests - not yours! Remember, we work for you. Not your insurance company. We’ll conduct a thorough assessment of your loss from a detailed reviewing of your policy and building estimates to furniture inventories, fixtures and any equipment. We factor in time loss, as well as loss of rents, additional living expenses and loss of income. The fact is, we’re able to negotiate settlements for thousands of dollars or more than you could if you negotiate on your own. Call us for a free on-site policy review and damage consultation. We provide a 24-hour service, 7 days a week, 365 days a year. If you're facing a major loss with your home or business, call us immediately. Let us help you get the compensation you deserve. Call now for free on-site policy review and damage consultation at (215) 309-4721. Copyright © 2018 phillyinsuranceadjuster.com All rights reserved.